The Crested Butte Titans soccer team got their first taste of Friday Night Lights and soaked up the experience to its fullest. The team opened the 2008 season with the Classical Academy Titan Cup tournament in Colorado Springs on Friday and Saturday, August 29-30. It was the first tournament for the Titans in the team’s brief history so far and was the first time ever the team got to play at night under the lights. Electrified by the lights and Friday night game scene, the Titans rattled Lake County for eight goals enroute to an 8-1 opening game win. The Titans struck early and often, netting its first goal in the first minute of the game when junior Jenner Currier fed senior John Wright inside the penalty area and Wright finished for the 1-0 lead. Seven minutes later, senior Jack Linehan found the net for the 2-0 Titan lead. Wright slipped through the Lake County defense again in the 30th minute of the half for his second goal of the game, and sophomore Mick Osmundson closed the first half with a strike from the weak side in the closing minute of the half for a 4-0 Titans lead. Currier and Linehan each netted another goal in the opening five minutes of the second half on assists from Wright to go up 6-0. Freshman Luis Aguirre battled through two Lake County defenders midway through the second half to score his first varsity game goal. Senior sweeper Jeremy Clayton dominated the air all game long in back to hold off the Lake County kick-and-run offense. Lake County slipped through just once all game long to finish, but the Titans closed the game with their eighth goal as Currier scored with 36 seconds left to cap the Friday Night Lights fever. The win sent the Titans to the tournament semi-finals against host team, the Classical Academy on Saturday. The two teams were evenly matched, mixing a wide-open offensive attack with short passes through the midfield. Titans goalie sophomore Ben Frame had an outstanding game in net, turning away several shots including a one-on-one, and the two teams went into halftime deadlocked in a 0-0 tie. 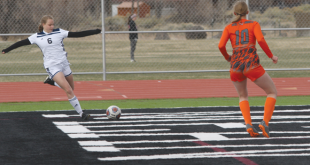 The difference in the game came in the 24th minute of the second half when a misplayed clearing pass by the Titans defense fell in front of a Classical Academy midfielder just outside the 18-yard box. After a settling touch, he cracked a line drive shot bound for the top shelf. Frame leapt up to deflect the ball but Classical Academy crashed the net and finished on the follow up for a 1-0 lead. Currier fired a shot just wide of the net shortly thereafter, and Classical Academy held on to edge out a 1-0 win. The Titans returned to the field one more time to face Lutheran Parker for third place. Both teams were beat up and beleaguered from the weekend of play but the Titans rallied in the final game of the weekend on the shoulders of Wright and Linehan. Both strikers tapped their reserves to continue pressing up top while sophomore Henry Linehan and Osmundson worked hard on the outside. Wright took a chip pass at the 50-yard mark and held off three Lutheran Parker defenders to carry the ball to net and finish for the 1-0 Titans lead. Wright connected again in the opening minutes of the second half when he soared above the crowd on a corner kick to bury the ball top shelf on a picture perfect header and a 2-0 Titans lead. Lutheran Parker responded seven minutes later to cut the Titans lead down to one but Frame and the defense held strong to preserve the one goal lead the final 30 minutes of the half and emerge with the 2-1 win and third place in the eight-team tournament. 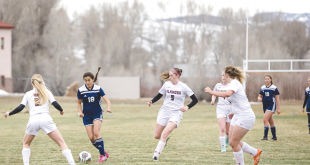 The Titans will open league play on Saturday, September 6 when they host Telluride at 11 a.m. at the Crested Butte Community School soccer field.